Tana French is best renowned for her Dublin murder squad mysteries. I can heartily recommend the most recent, the sixth in the series: The Trespasser. 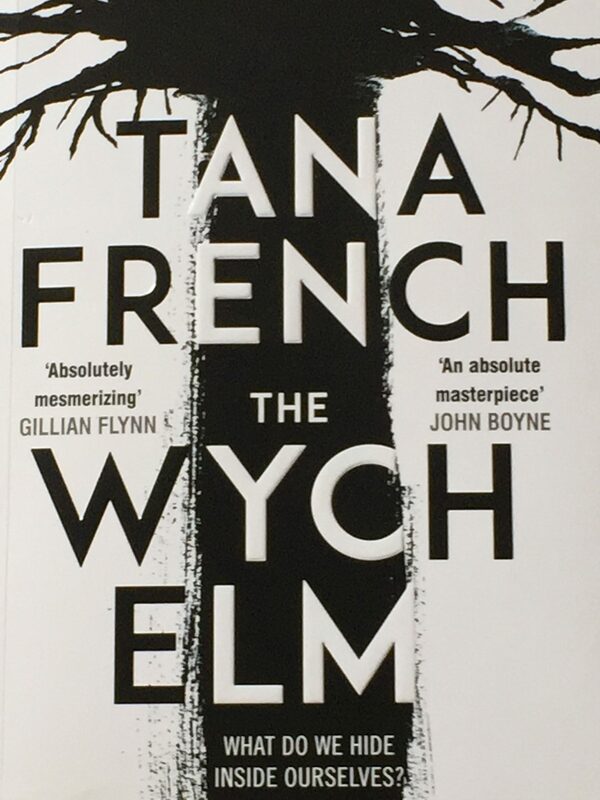 With her new book, The Wych Elm, she has branched (pun intended) out into stand-alone territory. And done so to tremendous effect. French is a former actor turned author. Drama is her forte. The chief protagonist of this book is Toby Hennessy, a 28-year-old PR guy who works at an art gallery. The book is written in the first person – “I’ve always considered myself to be, basically, a lucky person” is the first sentence in it. But Toby’s luck soon goes south as he is savagely beaten up by two burglars in his home, the motive unclear. After much trauma in hospital, albeit helped by his devoted girlfriend, Melissa, he continues his recovery at his family’s ancestral home in Dublin, the Ivy House, where his uncle Hugo, a genealogist, has been diagnosed with terminal cancer. The family thinking seems to have been along the lines of they can cheer/console each other together. At a family lunch shortly thereafter, the son of one of Toby’s cousins delves into the trunk of a wych elm tree in the garden. He finds a human skull. How long had it been there? Not that long – it turns out it represents what was formerly the head of a schoolboy called Dominic, a contemporary of Toby’s. (This is not a spoiler; the jacket blurb pretty much takes you to here.) And then we really are into the flow of it. His faculties still affected by the severe thrashing he’s been given, how reliable are Toby’s memories of his last encounters with Dominic? Why does he portray Dominic to the police as being an OK sort of guy whom he barely knew whereas others recall him as a bully and a mate of Toby’s? And Susanna and Leon, his cousins, really have it in for Dominic’s memory. Whatever happened to him at the Ivy House? And who put him in the tree? The storyline of The Wych Elm inevitably keeps returning to its narrator, and amid themes of sexual harassment and homophobia we see Toby as a victim, a suspect and an aggressor. His relationship with Hugo is complicated and gets more so; his relationship with his own mind is more complex still, the intense physical attack he has suffered making him doubt everything he thinks, in itself no wonder given that he’s pretty much constantly loaded with Xanax. Referencing her previous professional life in theatre, French told Alex Clark in that Guardian interview that she was “the only person who went into writing because it was a more stable career than what I was doing”. It’s one at which she is very strong.